Heat oven to 350°F. Line baking sheets with cooking parchment paper; set aside. In large bowl, break up cookie dough; add flour, egg and vanilla. Beat with electric mixer on medium speed until well mixed. Transfer mixture to large resealable, food-storage plastic bag. Cut 1/4 inch off corner of bag; pipe ring of dough onto baking sheet, approximately 2 1/2 inches across with an inside opening about 1 1/2 inches across. Repeat to use up dough, spacing about 2 inches apart. Bake 10 to 12 minutes or until light golden brown around edges. Cool on baking sheet 10 minutes; remove to cooling rack until completely cooled. Frost and decorate as desired. Add a few drops of food colour to vanilla frosting for fun. Multicoloured candy sprinkles also add to the playful look. 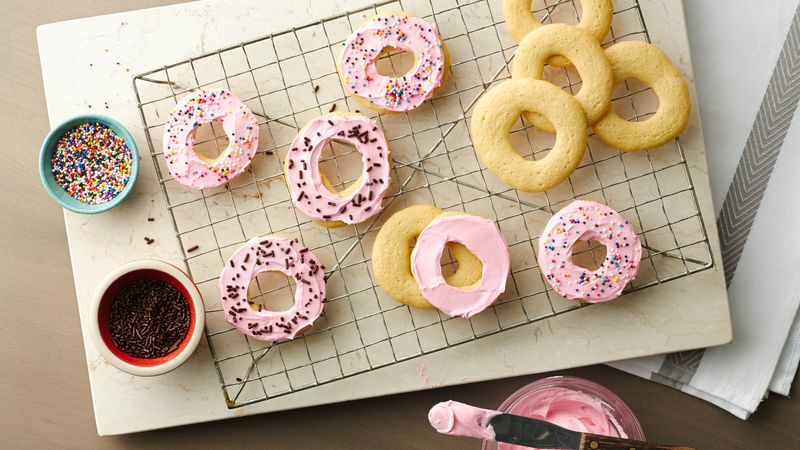 Try stacking 2 or 3 cookies with thin layers of frosting in between for a fun layered donut look.